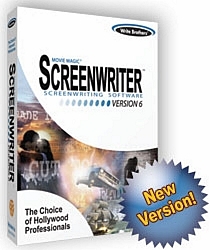 Movie Magic Screenwriter is hands-down the best screenwriting software on the market. In fact, the Writer's Guild of America software review gave it the highest marks out of the leading screenwriting products on the market! Real-time intelligent formatting, while you type! Powerful, full-featured word processor designed specifically for writers! Built-in 3x5 index cards you can re-arrange, automatically tied to your script, and printable! Time-savers like automatically finishing character names when you type the first few letters! iPartner-Screenwriter's exclusive real-time Internet collaboration tool that allows you and your partner to view and edit a script at the same time, while communicating through voice and chat features! Notes Commander-Allows you to quickly organize, access, view and print your script notes. Text to Speech-Allows Screenwriter to read a script aloud to you in a variety of assignable voices. Increased Stage Play formatting support. Web Links and Web Resources provide useful and customizable links to internet screenwriting resources. Enhanced production features including easier menu access and more. On-screen MS Word®-style underlining of misspelled words -- are you used to the way MS Word underlines all your misspelled words on-screen? Well, then Screenwriter is the program for you, as it can now do the same, including offering you correction suggestions and learning options when you right-click on the misspelled word. Improved Novel Formats -- want to turn your script into a novel? Do it in Screenwriter! It now supports auto-indention of paragraphs, justified, double-spaced prose text, running Chapter and Book headings and all the ease of use you've come to expect. Plus dozens of features and enhancements! "The way we work, the script changes moment by moment. Screenwriter helps us keep track of the revisions, making sure the latest draft is always in the director's hands." "Compared to what I was using, discovering Movie Magic Screenwriter was like coming out of a cave and finding everyone else living in houses." real time formatting -- see both tv & movie script formatting as you type. mores & continueds are automatically added. production features -- a & b pages, scenes, and revision marks are a snap. auto-recognitions -- type just a few letters of the desired character name, set, scene, etc., and screenwriter will enter it instantly. or hit enter to choose from a pop-up menu. tab/enter simplicity -- just hit the tab and enter keys to move between script elements such as character, dialogue, action, etc. script scanning - this feature scans the entire script looking for and correcting common formatting errors. spell checker & thesaurus - fully integrated with complete definitions, synonyms, and antonyms that makes editing a snap. drag and drop editing - highlight a block of text (e.g. dialogue) and move it to any part of your script. all your script formats will be saved. extensive importing & exporting - screenwriter can import and export almost any text document (e.g. rtf, ms word, word perfect, ascii). script notes - jot down revision notes, casting suggestions, research questions, notes that you don't want to forget. keep them hidden in the file, print them in a report with page-number references. optional foreign dictionaries - danish, dutch, french, finnish, german, italian, norwegian, spanish, swedish, and uk english. expanded production features-including an automated revision draft process, productions solutions help, and onscreen revision draft colors-are organized on their own dedicated menu. built-in index cards are now fully editable. create countless unique character names from namebank's huge database of male, female, and last names. exports to storyboard quick format for scene visualization.